Quite by accident I discovered how we are linked to the Rockefeller family known widely in the United States. I was exploring up a side of the tree and ran across someone who married a woman with the surname Rector. 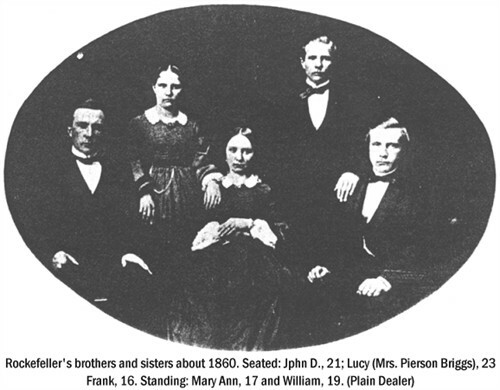 Thinking that perhaps this family may have been named for some notable religious person, I started exploring that family line. Much to my surprise, I would discover in only a couple of generations that name had been Richter and was changed. It appeared then that they were not going to trace back to some English Rector or whatnot, but would in fact adventure back into Germany instead. Lo and behold, upon the family journey backward in time, I stumbled upon something peculiar. One of the males married a woman named Gertrude Charity Rockefeller. Rockefeller… not the most common name, and one that I definitely recognized! I started my exploration, wondering where in the family of Rockefellers my branch would tie in. Well it turns out we’re quite distant cousins, but it is (rather unsurprisingly) the same Rockefeller family of American renown. John D and William Rockefeller are my 6th cousins, 7 times removed. Making their lecherous, bigamist, good for not much at all father my 5th cousin, 8 times removed. While clearly a distant relative, it was amusing to run across someone I had no idea was going to be playing a role in my family tree. I’m now quite curious to see if the rumors are true of the Rockefellers being related to the French Huguenots and the surname Roquefeuil / Roquefueille. The reason primarily being that since I’ve already traced my French King family line back so far that I’m knee-deep in mythological stories mixed in with everything else as I explore the family history of 300’ish AD. That said, I have plenty of information around the time of the French Huguenots in the 1500’s, so I should be able to see if there is a higher-up tie-in with some relatives.